Did you know that falls are the leading cause of death in the construction industry, accounting for over 3,500 fatalities between 2003 and 2013? A report from the Occupational Health and and Safety Administration (OSHA) reports that a whopping 34% of those deaths are a results of a falls from a roof. 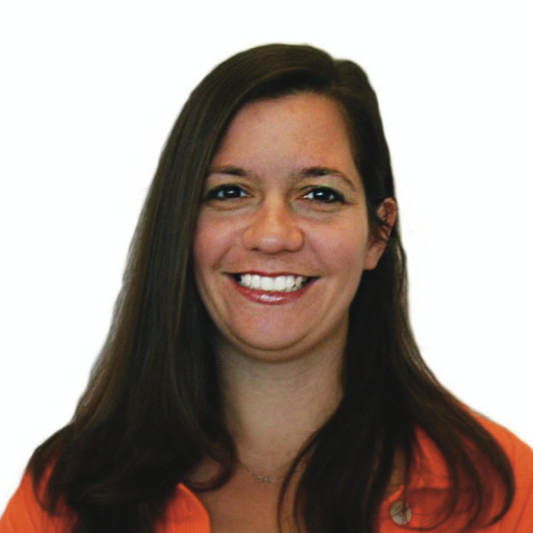 Most working professionals usually adhere to basic roof safety practices. However, after many years on the job, or even long working hours, bad habits can easily form. Those bad habits often result in accidents and injuries. According to roofingcontractor.com the leading causes behind compensation claims are ergonomics and musculoskeletal disorder (MSD). It’s not hard to see why this is at the top of the list, since most roofing jobs become a challenge due to ever-shifting work conditions. Having other people with you can save your life. While we don’t doubt your superior roofing skills, you should never work on a roofing project solo. Ever. 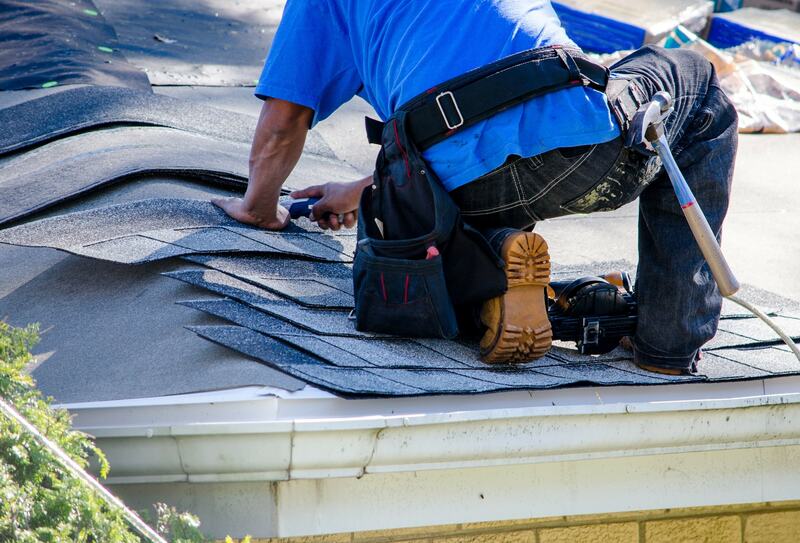 Having at least one person up there with you not only ensures the timeliness of a roofing project, but if an accident were to occur, you’d have someone to assist you. Plus, it can get lonely up on a roof all by yourself. A little companionship never hurt anyone. Work boots like these are preferred, even though it is common to see roofers in Vans. We still haven’t yet figured out how to walk on water, but we do know the best way to walk safely on the roof: traction-based shoes. Having the right shoes prevents the likelihood of slips and falls. Do not use the keychain version of these as they aren't meant for actual use. 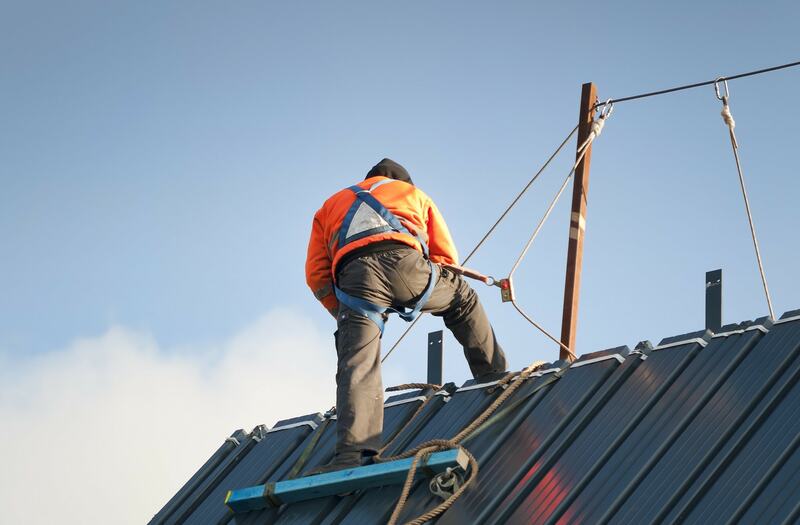 Always, always, always use a safety harness when doing any type of roofing. 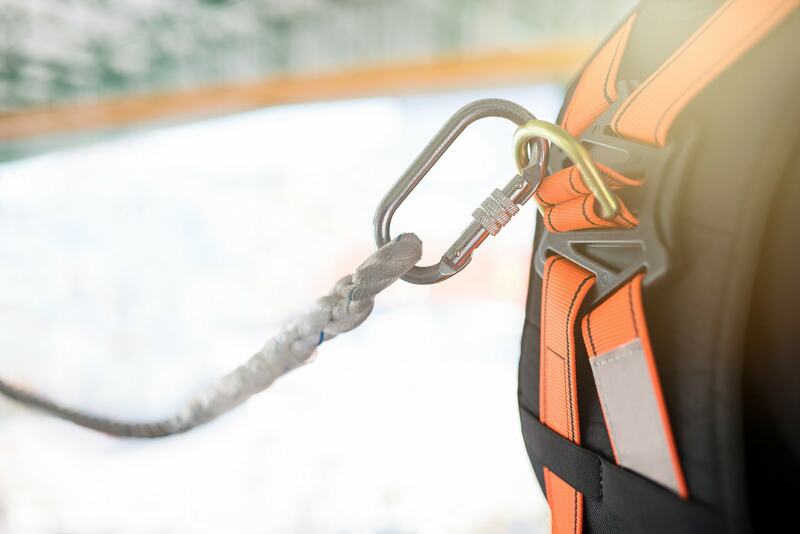 Make sure the harness is properly attached to a permanent roof anchor on the ridge of the roof, so as to prevent falls or other serious injuries. This is the “Lifeline” that connects the harness to the anchorage. This will help insure that if you lose footing, you will have a backup safety mechanism. This important piece of equipment is where the snap hook of the lanyard should be attached. 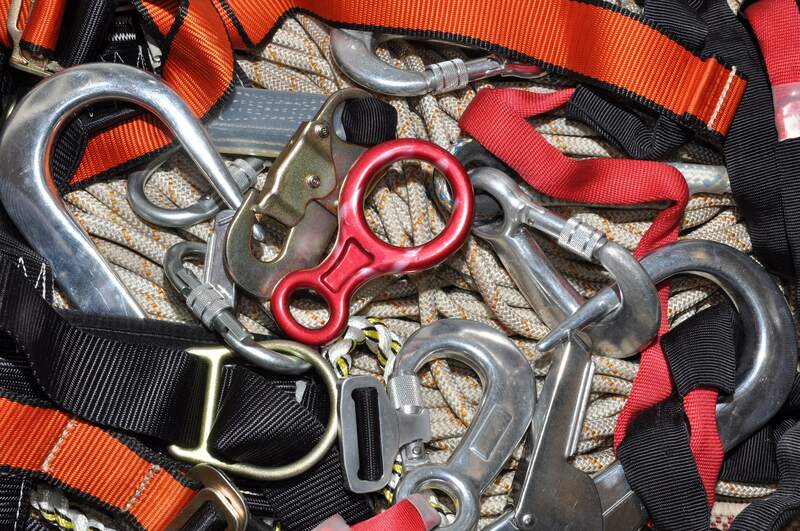 Once you’ve geared up with these items, the next step is to create what OSHA defines as a Personal Fall Arrest System. Your ladder should always be on a solid, level surface. 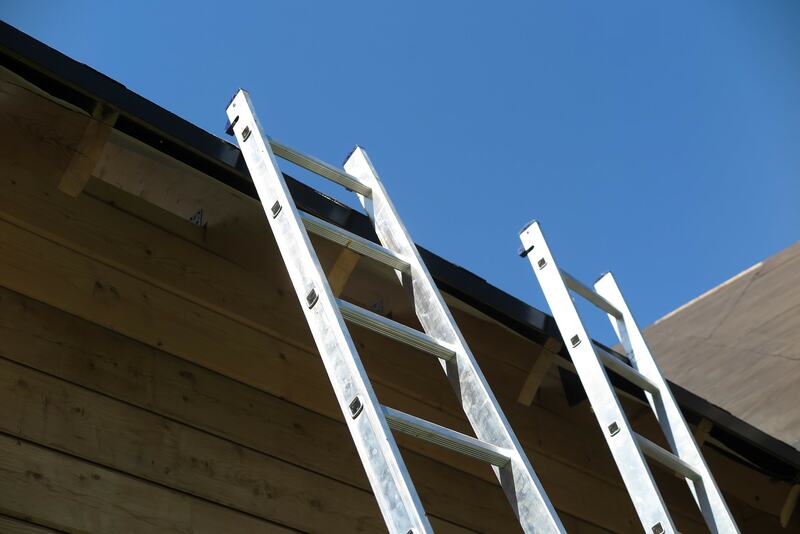 If the roof you’re working on is uneven, we highly suggest adding a ladder leveler. Be sure to dig small holes for the feet if your ladder ends up being on grass or dirt, so the ladder doesn’t slide out of place. If you’re on a patio or deck, attach a board behind the bottom of your ladder feet to keep it from slipping or sliding on the surface. The ladder should always extended at least 3 rungs above the contact point on the gutter so it’s reachable during the dissension approach. As with any work environment, always do well to keep the roof you’re working on free from debris, scattered nails and roof materials, so as to avoid slips and falls. If your company specializes in roofing work, safety is key. It’s never a good idea to skip safety practices, even if it means taking a little more time to get the job done. More times than not, it’s the negligence of basic safety practices that result in serious injuries and accidents. Not every roofing job is the same. Sometimes, it helps to have an expert opinion before getting started. The expert professionals at Work-Fit assist you by assessing your safety measures and providing your employees with biomechanics coaching and injury prevention strategies. We provide an extensive analysis your company needs to ensure all your roofing jobs are safe ones. Contact us here today!